Figure 1. 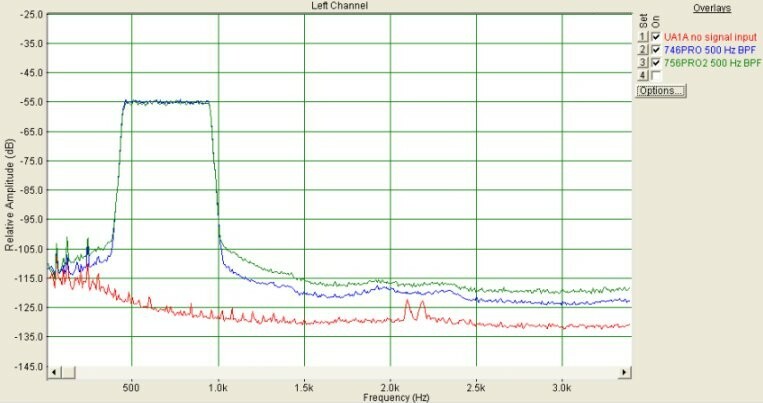 Spectral plots for no-signal, IC-746Pro and IC-756Pro II. Signal source: band noise on 50.197 MHz CW with 500 Hz BPF setting. Peak in-band responses set equal as shown. Sampling was 88,200 sample/sec with 16,384 FFT samples and a running 500-spectrum average with Hanning smoothing. Radio input to program via audio-to-USB conversion unit, Edirol UA1A with opto-coupled stereo input and output and 44.1 kHz sampling of 16-bit data. Filter centered on 700 Hz. Almost precisely 500 Hz wide at the top. Note that IC-746Pro stopband attenuation is approx. 10 dB better than that of IC-756Pro2. This suggests slight superiority of the newer IC-746Pro code and TI DSP processor (vs. ADI SHARC in IC-756Pro II). Disregard spikes in 0 ~ 250 Hz region (probably AC mains harmonics).